Over the years, there has developed a sort of clear understanding of what the El Dorado 15 YO is, deriving from the wooden stills that make up its core profile – that tastes are well known, consistently made and the rum is famed for that specific reason. Therefore, the reasoning for expanding the range in 2016 to include a series of finished versions of the 15YO remains unclear. DDL may have felt they might capitalize on the fashion to have multiple finishes of beloved rums, or dipping their toes into the waters already colonized by others with double or multiple maturations. On the other hand, maybe they just had a bunch of Portuguese wine barrels kicking around gathering dust and wanted to use them for something more than decorations and carved chairs. 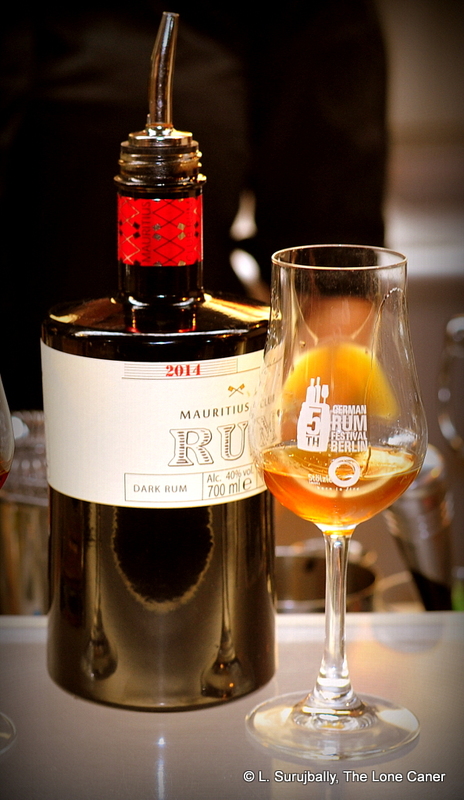 Few people – including us scriveners – will ever have the opportunity or desire to try the entire Finished line of rums together, unless they are those who attend DDL’s marketing seminars, go to Diamond in Guyana, belong to a rum collective, have deep pockets or see these things at a rum festival. The price point makes buying them simply unfeasible, and indeed, only two writers have ever taken them apart in toto – the boys in Quebec, and the Rum Shop Boy (their words are an excellent supplement to what I’ve done here). Lightly sweet with licorice, toffee and fruity notes on the nose. Cherries, plums, raisins and watermelon on the palate, all staying quiet and being rather dominated by salt caramel and molasses. Opens with acetones and light medicinal aromas, then develops into a dry nose redolent of peanut butter, salt caramel, fruits, raisins, breakfast spices and some brine. The taste was rather watery – pears, watermelons, caramel, toffee, anise and cognac filled chocolates. Very mild, light brown sugar nose, some caramel, brine, sweet soya. Taste was similarly quiescent, presenting mostly citrus, coffee, chocolate, bananas, and of course, molasses and caramel toffee. Nice: soft attack of sawdust and dark fruit: plums, pears, raisins, black grapes. Leavened with ripe orange peel, peaches and olives before muskier aromas of toffee and chocolate take over. Citrus disappears on the palate, replaced by salted butter and caramel drizzled over vanilla ice cream. Also bananas, kiwi fruit, oranges gone off, cinnamon and cloves. Nice, but weak. Marginally my favourite overall: noses relatively darker and richer and fruitier than just about all the others except the “Dry” – delicate nose of peaches, raisins, cinnamon, cloves, caramel, peanut butter, cherries in syrup, candied oranges, bitter chocolate. Soft palate, quite dry, oak is more forward here, plus raisins, cloves and cinnamon carrying on from the nose, and the fruitiness of peaches in syrup, cherries, plus toffee, salt caramel. Subtly different from the others. Nose of aromatic tobacco, white almond-stuffed chocolate and nail polish, then retreats to salty caramel, molasses, vanilla, cherries, raisins, lemon peel and oak, quite a bit of oak, all rather sere. Palate retains the tobacco, then vanilla, chocolate, coffee, molasses and quite a bit more dried dark fruit notes of raisins, plums, dates, and a quick hint of anise. The oak is quite noticeable, and the rum as a whole is quite dry. Unsurprisingly, there are variations among those who’ve looked at them, and everyone will have favourites and less-liked ones among these rums — I liked the Sweet Madeira the best, while one Facebook commentator loved the Ruby Port, Simon much preferred the White Port Finish and Les Quebecois put their money on the Dry Madeira. This variation makes it a success, I’d say, because there’s something to please most palates. The Finished range of rums also make a pleasing counterpoint to the “Basic” El Dorado 15 Year Old…something for everyone. But taken as a whole, I wonder – my overall impression is that the woodsy, musky, dark profile of the Port Mourant double wooden pot still, which is the dominant element of the ED 15, is affected — but not entirely enhanced — by the addition of sprightly, light wine finishes: the two are disparate enough to make the marriage an uneasy one. That it works at all is a testament to the master blender’s skill, and some judicious and gentler-than-usual additions to smoothen things out – the Standard ED-15 clocks in at around 20 g/L of additives (caramel or sugar), but these are substantially less. 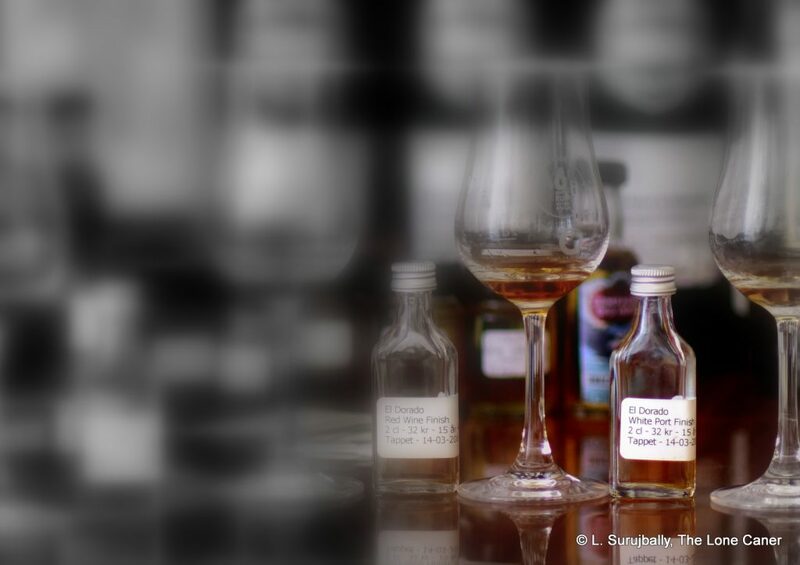 Which is a good thing – it proves, as if it ever needed to be proved at all, that DDL can forego sweetening or caramel additions after the fact, with no concomitant loss of quality or custom (why do I have the feeling they’re watching Foursquare’s double matured Exceptional Cask series like a hawk?). What the series does make clear is that DDL is both courageous enough to try something new (the finishing concept), while at the same time remaining conservative (or nervous?) enough to maintain the continuing (if minimal) addition of adulterants. DDL of course never told anyone how popular the Finished Series are, or how the sales went, or even if the principle will remain in force for many years. Perhaps it was successful enough for them, in early 2018, to issue the 12 year old rum with a similar series of finishes. All the preceding remarks sum up my own appreciation for and problems with the range. None of them eclipse the 15 year old standard model (to me – that is entirely a personal opinion); they coexist, but uneasily. There are too many of them, which confuses – it’s hard to put your money on any one of them when there are six to chose from (“the paradox of choice”, it’s called). Their exclusivity is not a given since the outturn is unknown. The unnecessary dosage, however minimal, remains. And that price! 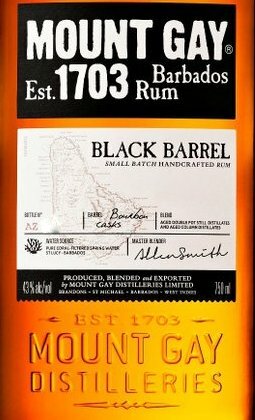 In what universe do rums that don’t differ that much from their better known brother, and are merely labelled but not proved to be “Limited,” have an asking of price of more than twice as much? That alone makes them a tough sell. (Note – the 12 year old Finished editions which emerged in 2018 without any real fanfare, also had prices that were simply unconscionable for what they were). The people who buy rums at that kind of price know their countries, estates and stills and don’t muck around with cheap plonk or standard proofed rums. They may have money to burn — but with that comes experience because wasteage of cash on substandard rums is not part of their programme. They are unlikely to buy these. The people who will fork out for the Finished series (one or all) are those who want a once-in-a-while special purchase… but that doesn’t exactly guarantee a rabid fanbase of Foursquare-level we’ll-buy-them-blind crazies, now, does it? My personal opinion is that what El Dorado should have done is issue them as a truly limited series of numbered bottles, stated as 16-17 years old instead of the standard 15, and a few proof points higher. Had they done that, these things might have become true collector’s items, the way the 1997 single still editions have become. In linking the rums to the core 15 year old while making them no stronger, not explosively more special, and at that price, they may have diluted the 15YO brand to no great effect and even limited their sales. But at least the rums themselves aren’t crash-and-burn failures, and are pretty good in their own way. We have to give them points for that. This is the sixth and last short form review of the six “finished” variations of the 15 year old El Dorado rums. Because they’re all based on the standard 15 year old which is very well known, I’ll be briefer than usual in my descriptions, rather than provide an essay in each case. Tomorrow I’ll wrap them all up with a summary and such observations as seem relevant. 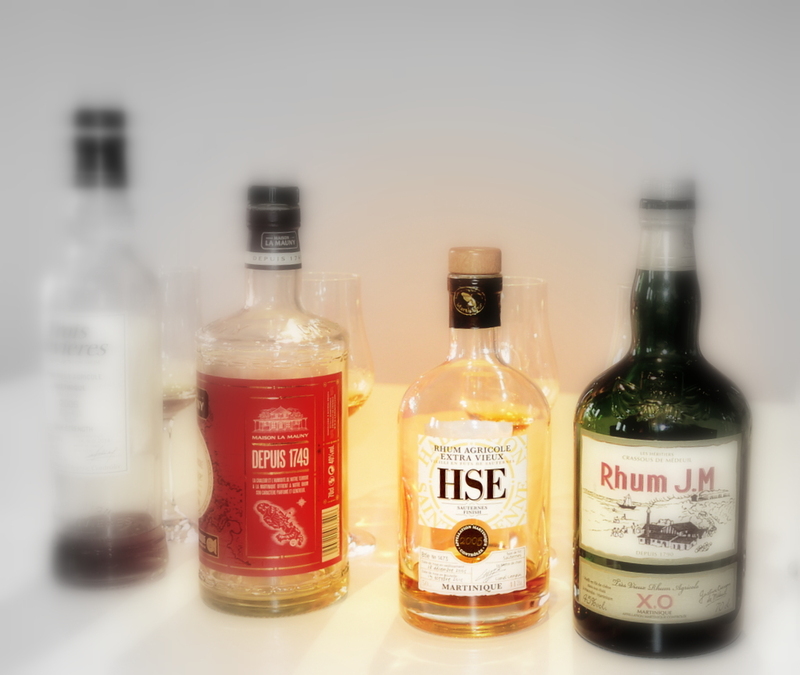 The rums were all tasted together, blind, in a four-hour session, using the original (retasted) El Dorado 15 with a non-blind score of 82, as a control baseline. All point scores relate to that rum. As for all these finished El Dorados, the basic component is the 15 year old, and an additional 18-24 months of finishing is done…strictly speaking that makes it (and all the others) at least a 16 year old rum, which is nice. 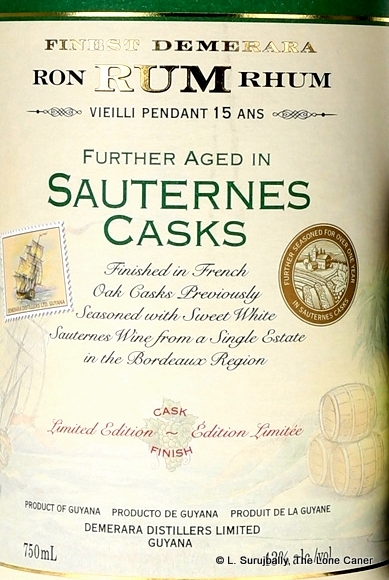 In this case, the finish is done in casks that once held (were “seasoned with”) Sauternes wine, a sweet white from the Sauternais region in Bourdeaux characterized by concentrated and distinctive flavours. 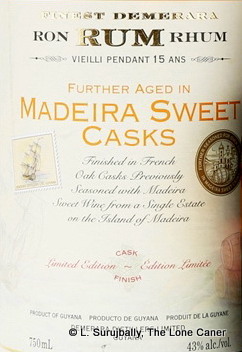 And like with the Sweet and Dry Madeira-finished rums, the source estate of the casks is not named, for whatever obscure reason. Nose – In a subtle way this is different from the others. It opens with aromatic tobacco, white almond-stuffed chocolate and nail polish before remembering what it’s supposed to be and retreating to the standard profile of salty caramel, molasses, vanilla, cherries, raisins, lemon peel and oak, quite a bit of oak, all rather sere. Palate – The tobacco remains but the familiar El Dorado profile is more robust: vanilla, chocolate, coffee, molasses and quite a bit more dried dark fruit notes of raisins, plums, dates, and a quick hint of anise. The oak is quite noticeable for all the rum’s softness, somewhat mitigated by salt caramel and toffee. It is also quite dry, and much of the near-cloying sweetness of the regular El Dorado 15 YO is absent. Finish – Nope, no joy here, soft, wispy, short and over way too quick. Raisins and unsweetened chocolate, some almonds, and just a hint of orange zest. 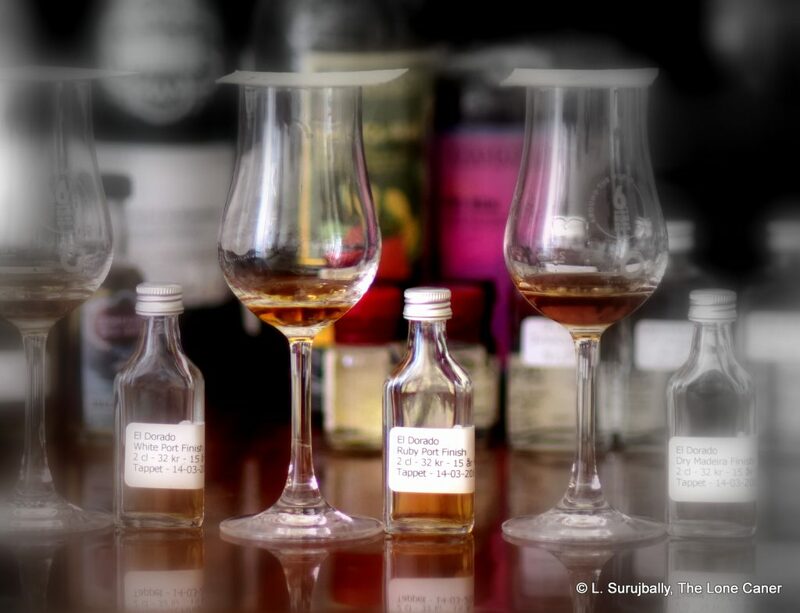 Thoughts – Well, it’s intriguing to say the least, and when you have a number of rums all of generally similar profiles, it’s always interesting to have one that’s a bit bent. I liked it, but not enough to dethrone either the Standard 15 YO or my own pet favourite of the series, the Sweet Madeira. This is the fifth short form review of the six “finished” variations of the 15 year old El Dorado rums. Because they’re all based on the standard 15 year old which is very well known, I’ll be briefer than usual in my descriptions, rather than provide an essay in each case; and then wrap them all up with a summary on the last day. As for all these finished El Dorados, the basic component is the 15 year old, and an additional 18-24 months of finishing is done. In this case, the finish is accomplished in French oak casks which once held a sweet madeira wine from an unnamed estate on the Portuguese island of Madeira, so it may be the same estate as the “Dry” I looked at yesterday. I’m unclear why the estate is a point of secrecy, and, as with all others in the series, the rum is noted as a limited edition without ever actually coming out and stating the true outturn (I’ve read it’s around 3,000 bottles) – so how limited it truly is remains an open question. Nose – Leaving aside a slight sweetish note (which I suppose is to be expected, though still not entirely welcome), it noses relatively darker and richer and fruitier than just about all the others except the “Dry”…within the limits of its strength and mild adulteration. Peaches, raisins, cinnamon, cloves, caramel, peanut butter, cherries in syrup and candied oranges, even a little bitter chocolate. It’s all rather delicate, but quite pleasant. Finish – Dry, rather longish (always nice), final aromas of almond chocolate, raisins, cloves. Thoughts – It is supposedly finished in Sweet Madeira casks, but it’s actually less sweet than the Dry Madeira, and more dry. That makes it pretty good in my book, and I felt it was the best of the six. This is the fourth short form review of the six “finished” variations of the 15 year old El Dorado rums. The 15 year old is the core of it all, and so I’ll be briefer than usual in my descriptions, rather than provide an essay in each case; and then wrap them all up with a summary on the last day. As for all these finished El Dorados, the basic component is the 15 year old, and an additional 18-24 months of finishing is done, which is edging close to a double maturation territory rather than just a finish, but I’m not a total pedant in this matter, so it’s just noted for completeness. In this case, the finish is accomplished in French oak casks which once held (or were “previously seasoned with”) a dry madeira wine from an unnamed estate on the Portuguese island of Madeira – which, as an aside, is getting its own quiet rep for some interesting rums these days. Nose – By far the best nose of the six, really liked this one a lot: sawdust and biting dark fruit undertones of plums, juicy pears, raisins, black grapes. Leavened with ripe orange peel, peaches and olives before muskier aromas of toffee and chocolate take over (as they do in all of these rums, eventually). 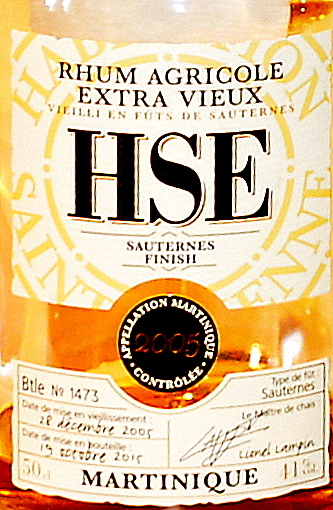 Palate – Very smooth, but some of the sharp citrus-y element of the nose disappears. Salted butter and caramel drizzled over vanilla ice cream. Softer fruits here, not sharper ones – bananas, kiwi fruit, oranges gone off. Oh, and some spices – cinnamon and cloves. Nice, but weak (which is something all these rums seem to have in common). Finish – Peanut butter and soya linger alongside toffee and chocolate orange fumes, quite short. Thoughts – Certainly the best nose, and very nice depth and complexity, though writing this, I wonder where the tartness supposedly characteristic of a dry Madeira went and hid itself (such wines are not quite the same as the red wine, ruby port or white port – they tend to be somewhat sweet, quite dry and have a somewhat tart, or acidic, profile). I also felt that even the taste, for all its complexity, let it down somewhat by — again — being just too delicate. In a mix of any kind, the subtleties of those flavours would all disappear almost completely, and I personally prefer something more distinct or forceful when sipped neat (as this one absolutely can be). Nevertheless, a good rum by any standard for its strength. This is the third short form review of the six “finished” variations of the 15 year old El Dorado rums. Because the basic information is similar in general – the original 15 year old is the core of it all, of course – I’ll be briefer than usual in my descriptions, rather than provide an essay in each case; and then wrap them all up with a summary on the last day. As for all these finished El Dorados, the basic component is the 15 year old, and an additional 18-24 months of finishing is done, which is edging close to a double maturation territory rather than just a finish. 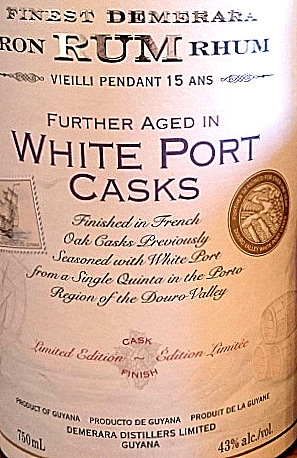 In this case, that finish is accomplished in French oak casks which once held (or were “previously seasoned with”, whatever that means) White Port from the Douro valley in north-west Portugal. Nose – At first there didn’t seem to be much of anything there, it was so mild as to be lightly flavoured alcohol. But after some minutes it got into gear and revved up some, with a solid core of light brown sugar, molasses, salt caramel, some sweet soya. Not much deep fruitiness here, just light grapefruit, bananas and nuttiness, and sweet white chocolate. Palate – I came back to this one rum over and over again, thinking it was me, that this weak-kneed profile was palate fatigue or something, but no, there really wasn’t much to talk about both at the beginning of the tasting session, or at the end. There was citrus, toffee, chocolate, caramel, brine, bananas – all the hits from the nose – some vanilla and breakfast spices, and if there was more, I certainly couldn’t get it (which may be my problem, not yours). More subtlety than force here. Finish – Better: nice and dry, a combination of sweet and tart and salt all at once. Restrained oakiness, vanilla, nutmeg, citrus peel, and the nuttiness remains consistently noticeable and in the background throughout. Thoughts – Well, it’s subtle all right – so much so that it actually felt watered down. Weakest of the bunch for me. If ever there was a case to be made for moving to higher proofs in some rums, this one is a good example of why. I have to point you to Simon’s review here, because he was much more enthusiastic than I was, so for balance, read his notes. This is the second quick look of the six “finished” variations of the 15 year old El Dorado rums. Because the basic information is similar in general – the original 15 year old is the core of it all, of course – I’ll use the short form to describe them rather than an essay in each case, and then wrap them all up with a summary on the last day. 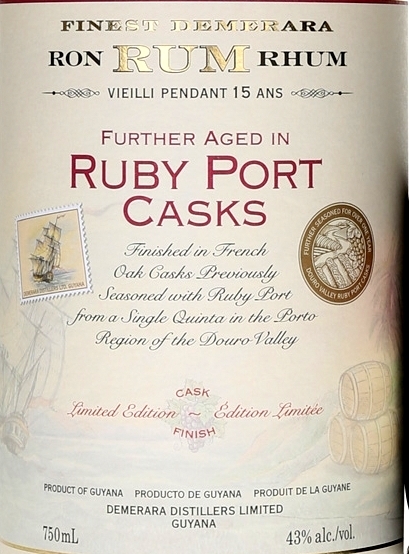 This rum is also finished in a French oak cask, one which held Ruby Port (a fortified red wine from the Douro valley), which is characterized by being bottled young and maintaining a rich fruity flavour. As for all these finished El Dorados, the basic component is the 15 year old, and an additional 18-24 months of finishing is done, which is edging close to a double maturation territory so effectively colonized by Foursquare in recent years. Nose – This has a light, sweet, almost delicate series of smells. There are acetones, flowers and some faint medicinal, varnish and glue aromas floating around (I liked those – they added something different), and initially the rum noses as surprisingly dry (another point I enjoyed). These then morph gradually into a more fruity melange – tinned cherries in syrup, ripe pears, pineapples, watermelons – while remaining quite crisp. It also hinted at salted caramel, crunchy peanut butter, breakfast spices and a little brine, and the balance among all these seemingly competing elements is handled really well. 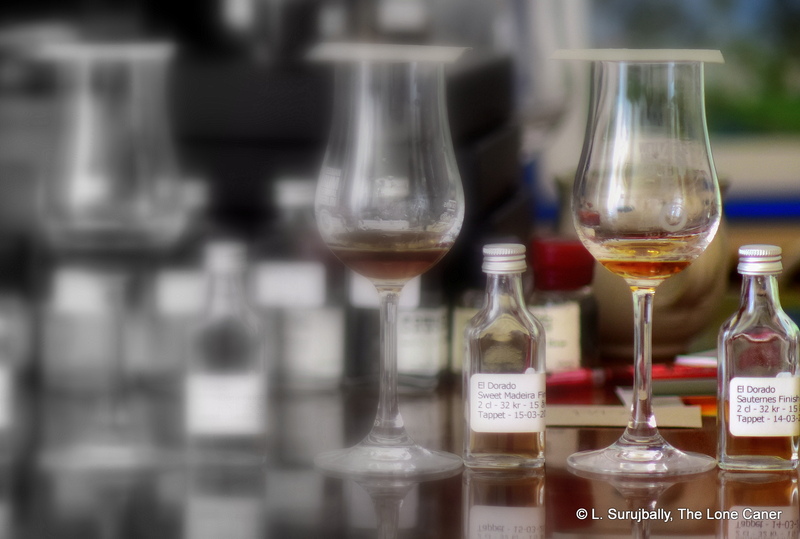 Palate – Not sure what happened between nose and palate, but it comes across on the tongue as rather watery and mild. The fruits exist, pears, watermelons and so on, as well as the caramel, anise and toffee, but the overwhelming mental image that I get is of rum-and-syrup-soaked pears, and those chocolates with a soft cognac filling. All very quiet and restrained, with little else. Finish – Wispy and faint, short, weakest point of the exercise. Plums and cherries, with some vanilla and okay undertones. Thoughts – Some Ruby Port wines are dry and some quite sweet, but after the nose, little of the former and more of the latter were in evidence with this rum. Strength remains an issue for me here, I think 43% is simply insufficient to properly showcase the effects of the finish. It’s there, just not enough of it and it rather chokes on the taste, where the mildness becomes a factor in trying to separate out the various components. Still, this one is pretty good, and the nose is outstanding, well balanced and a joy to sniff for a long time. 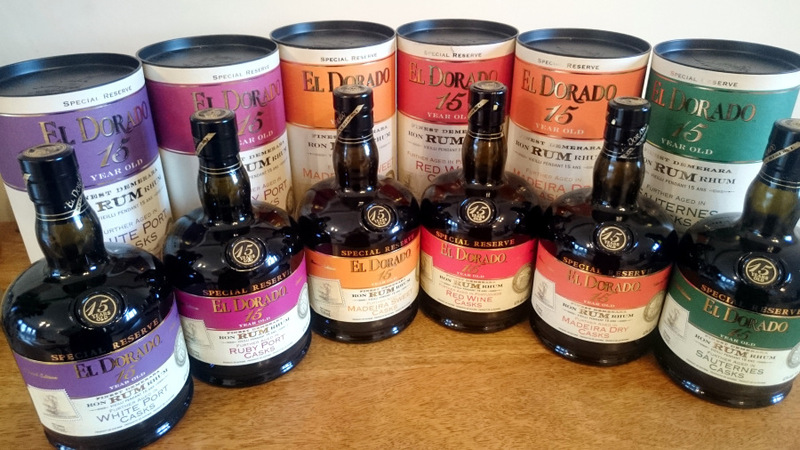 This entire week I’ll look at the six “finished” variations of the 15 year old El Dorado rums, one per day. Because the basic information is similar in general – the 15 year old is the core of it all, of course – I’ll use the short form to describe them rather than an essay in each case, and then wrap them all up with a summary on the last day. 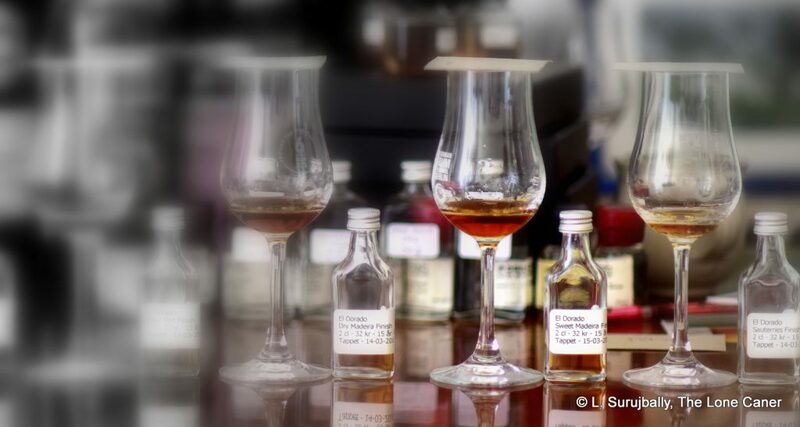 The rums were all tasted together, blind, in a four-hour session, using the original El Dorado 15 with a non-blind score of 82, as a control baseline. All point scores relate to that rum. The El Dorado 15 Year Old needs no long winded recap – it’s one of the best known rums in the world, and I’ve looked at it twice now, once many years ago, and again as a Key Rum of the World. In 2016 El Dorado decided to add to the lineup by releasing six rums with varying barrel finishes. Whether these succeeded in capturing a serious slice of the market is unknown, but certainly they must have liked it because in 2018 they released another six based on the 12 Year Old. 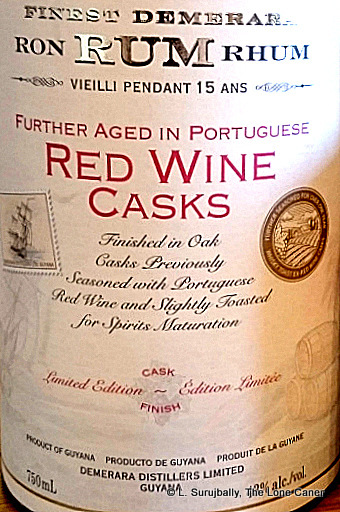 In each case, aside from the standard fifteen years of ageing, an additional 18-24 months of secondary finish was applied, in lightly toasted (charred) red wine barrels from Portugal (no further detail) in this case. Nose – Somewhat dry and redolent of sawdust, accompanied by delicate flowers an acetones. Quite solid and lightly sweet, and deserves to be left to stand for a while, because after some minutes the molasses, caramel and light licorice notes characteristic of the line begin to make themselves felt, and are then in their turn dethroned by a deep fruitiness of ripe cherries, blackcurrants, plums, raisins and black grapes almost ready to spoil. In the background there’s some leather and citrus, neither strong enough to make any kind of serious impression. Palate – Much of the fruitiness carries over from the nose: the cherries, the ripe grapes, the plums, blackcurrants and so on. Not much new is added, maybe some watermelons and pears. It all remained very much in the background as slight hint and never dominated the entire experience: that was handled by the core flavours which reversed their previous reticence on the nose and dominated this stage of the rum. So what we get is a large taste of brown sugar, salt caramel, molasses, bitter chocolate, vanilla, sweet breakfast spices, oak and anise…but they eclipse the subtleties of the red wine too much, I think. Finish – It’s okay, medium long, not really spectacular…at 43% it’s not to be expected, really. Sweet and somewhat indeterminate for fruits (almost impossible to pick out individually here), and with an intriguing peanut butter and caramel core leavened by some light flowers. Thoughts – Not too bad, an interesting variation on the theme. Too weak at 43%, though it’s logical that cask strength lovers are not the target audience for it. I think it could safely go to 46% without alienating anyone. Too, the basic ED profile remains too overwhelming, and while the influence of the Red Wine is noticeable, it’s not clear enough or distinct enough. It can be sensed rather than directly experienced. Still, not entirely something I’d throw away with yesterday’s fish. The Mauritius Club Rum 2014 (Sherry Finish) is an interesting essay in the craft, and for my money, slightly better than the Gold of Mauritius Dark rum I looked before. The sherry finishing makes its own statement and adds that extra fillip of flavour which elevates the whole experience in a way that drowning the Gold in port casks for a year did not. Note that there’s a strange disconnect between what I was told in 2015 by the brand rep, who informed me it was aged three months in oak casks (not what type) and then finished for two weeks in sherry casks; and what I see online these days, where the buying public is informed it is aged for six to eight months in South African wine barrels before finishing in sherry casks. Well, whatever. Whether three months or six, with or without the sherry ageing, the overall profile strikes me as doing too little and hoping for too much, which is a shame – with a few more years under its belt, this could have really turned heads and attracted attention. The things is, ageing can be either done right and for a decent interval (perhaps three years or more, with many believing the sweet spot is between eight and twelve), or dispensed with it altogether (as with the various unaged whites for which I confess a sneaking love). Go in the middle with less than a year? Plus a finish?…that may just be pushing one’s luck. It’s heading into spiced or flavoured rum territory. The reason I make these remarks is because when I started nosing it, believing that 40% couldn’t seriously harm me, it lunged out in a schnozz-skewering intensity that caught me unprepared, the more so when had in a series with the far gentler and warmer and more easygoing muffled blanket of the Gold I’d just sampled before. To be fair though, once it settled down, there were notes of red wine (no surprise), raisins, caramel, chocolate vanilla, and something vaguely sharper, like those chocolate After-Eight mint biscuits. The palate was softer, smoother, warm rather than hot, after the initial heat burned away.. Again, lots of sweet wine, and the sherry makes itself felt. Honey, some nuttiness (I was thinking breakfast cereals like cheerios) plus a little fruitiness, cherries, more vanilla, more chocolate and vanilla. Truth is, too little going on here, and overall, somewhat uncoordinated and quite faint. A 40% strength can be perfectly fine, but it does make for a lesser experience and dampened-down tastes that a shooter wouldn’t capture and a mix would drown and a sipper would disdain. The finish was okay for such a product, being short and easy, warm, redolent of nuts, more cheerios, honey and a very faint note of tannins. There was some character here, just not enough to suit my preferences. I know it sounds like I’m dissing the rum, but not really – as noted above, I liked it better than the Gold of Mauritius Dark even though it was younger, which I attribute to a better handling of the blend, and the sherry influence. Still, it must be said that the rum displayed something of schizoid character, too young and raw to be tamed with the port/sherry for the few months it aged, yet being promoted as being more than an unaged starter (that would lower expectations, which may have been the point). Moreover, when any maker puts a moniker of a single year on the bottle — “2014” in this case — it creates an impression of something a little special, a “millesime” edition of a good year…and that’s certainly not the case, as it’s simply the year the rum was made. And lastly, I argue — as was the case with the Gold — that by mixing it up with these external and rather dominating influences, the potential to experience a unique rum originating from a unique location with a very individual taste, was lost — to our detriment. So after this experience, I resume my search for the definitive rum from the island, the big gun that will put Mauritius on the map and allow us to use it as a quasi-baseline. Something that isn’t mixed, adulterated, finished or otherwise tampered with. I know it’s out there somewhere – I just have to find it. This one isn’t it.